Once again I was reminiscing about my mom’s cooking, and some of my favorite foods she made. Since I have been lucky enough to spend several of my adult years nearby my mom, I learned many of her cooking skills. 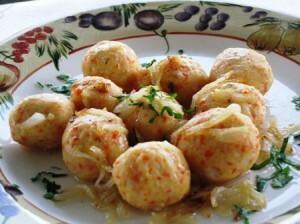 One of the items she cooked often, and I enjoyed very much, are Knedle, or Potato Balls. These are very quick to prepare, require few basic ingredients, and are quite versatile for serving plain with butter and sauteed onions, with tomato sauce, or even filled with fruit and served as an appetizer, or dessert . Today, I selected to make them plain, to be served chicken broth. For a quick meal, you can use a ready made broth. Place 1 1/2 cups of flour on your work area, in a heap. Mix the carrots into the mashed potatoes. Place the potato/carrot mixture into the flour. Make a well in the middle of the potatoes. Beat the egg and yolk, with salt, pepper, and garlic powder. Work it into the potatoes and flour mixture, and form a soft dough. Form into walnut size balls, by scooping a heaping teaspoonful, and rolling on a lightly floured surface. Set the ready balls on a floured surface, so they do not stick, while you are working with the remaining dough. You can also use a cookie scooper (smaller then an ice cream scooper) to scoop the dough directly from a bowl, dipping the scooper in water in between scoops, to prevent sticking, and dropping the scoops directly into the boiling water. You can also use a teaspoon to scoop the dough from the bowl, and release it directly into boiling water. 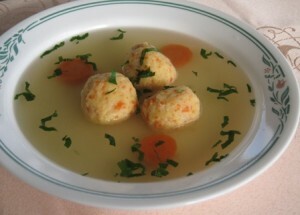 Drop enough potato balls into boiling water, to cover the bottom of the pot. Stir gently with a wooden spoon, so they do not stick to the bottom. Bring the water back to boil. As soon as all the balls come up to the top, remove them with a slotted spoon, into a strainer. Rinse with cold water to cool them off slightly. Let the excess water drip off, then remove them onto a plate in a single layer, to cool off. Repeat the same process until all dough is used up. Serve hot, or cool completely to refrigerate. If you wish to fill your potato balls with your favorite fruit, or cheese, you will need to modify the recipe, by removing the carrots, pepper and garlic. You might need a little more flour to make the dough workable.